This magic trick has been seen on the hit TV series "Criss Angel Believe" on SpikeTV! With this one trick you can perform over 20 different magic tricks to freek out your friends and audience. You can also learn to levitate other objects, as well as a bonus card trick by Criss Angel. 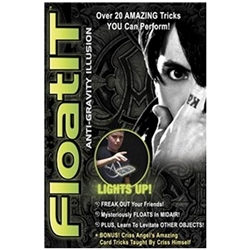 The magic trick includes: LED Anti-Gravity Card, FloatIT kit, Official Deck of Criss Angel Cards, Exclusive Web Link for Instructional Videos.